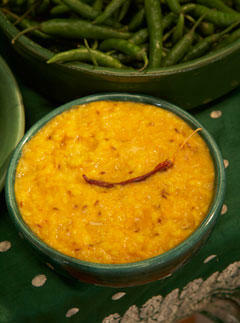 This dal uses tadka (pronounced ‘tur-ka') - a magical mix of spices sizzled in hot oil - to infuse the dish with flavour. 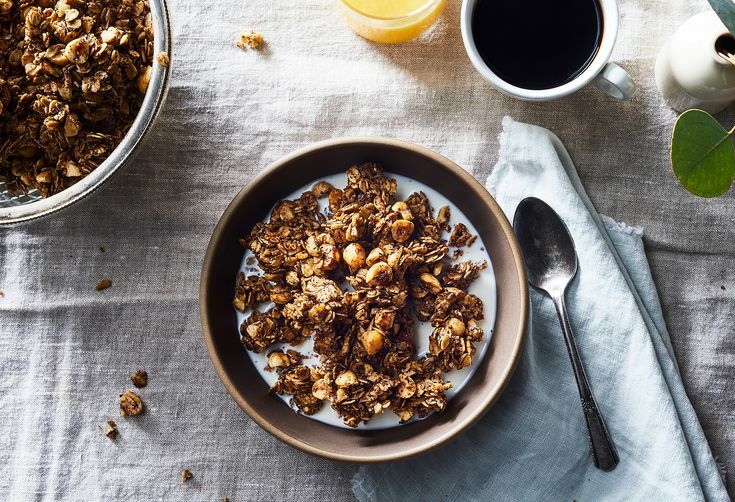 It's served thick, a consistency created by adding a little hot water at a time and only when the lentils dry up and start spluttering on to the kitchen tiles. Serves 4. 1. Place the lentils in a sieve and rinse thoroughly under a cold tap until the water runs clear. Put them in a medium pan and cover with twice as much cold water as lentils. Add the turmeric and boil gently on a medium heat, keeping alert for the first couple of minutes to make sure the pan doesn't boil over. water. The consistency of this dal should be thick, like soup from a carton. a few seconds and then pour the tadka over the dal. to taste, and voilà, the Berry Dal is ready. This is best eaten with rotis dunked in it. Miss Masala by Malika Basu is published by Collins, priced £14.99. The mango fool is hands down the most powerful antidote to a spicy meal. Normally this dessert is a creamy blend of ice-cold, ripe mango purée and heavy double cream. But I opt for the healthier but equally delicious alternative of lower-fat crème fraîche to return sensation to our mouths. Serves 4. 1. If using fresh mangoes, slice and peel the mangoes. My preferred way is to slice the top off, then cut lengthwise along the sides of the stone and then slice into quarters and peel. Don't forget the edges of the stone, which often contain a fair amount of juicy pulp too. Keep four tiny slivers of mango aside for decoration. 2. Smash the cardamom seeds with the flat edge of a knife and whiz them in a blender with the mango pieces or canned mango pulp. Check for sugar, adding some if your mangoes are very tart. 3. 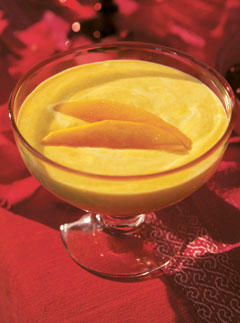 Finally, mix the mango purée evenly with the crème fraîche and spoon into four dessert bowls. Top off with a small slice of mango to decorate and chill in the fridge until you need to put out the fire. Graters are among my least favourite kitchen gadgets. For years, I avoided this recipe like the bubonic plague for fear of the mess I would end up with if I didn't lovingly grate half a kilo of carrots entirely by hand. And then I bit the bullet and shredded the stuff in a food processor. The result was fantastic. The texture perfect. And who really cares about the texture when the taste is so good? Roll up your sleeves and don't leave cooking this one for an age. Serves 4. 1. Preheat the oven to 190˚C (375˚C), gas mark 5. 2. Place the cardamoms on a baking tray and bake for about 10 seconds. Allow to cool, then crush in a coffee grinder or using a pestle and mortar. 3. Peel and roughly shred the carrots in a food processor. You will need to do this in 2-3 batches, depending upon the size of your machine, to avoid letting the odd lump of carrot. 4. In a medium pan, heat the ghee on a high setting and, when it is hot,stir in the sugar. 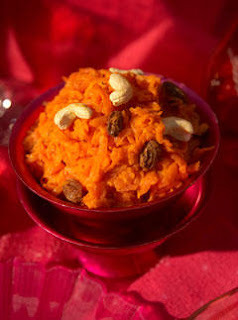 As it caramelises, mix in the grated carrots and sauté for 5 minutes until they begin to brown. Next, lower the heat to medium and stir in the milk and ground cardamoms. 5. Now all you have to do is stew the carrots for 15 minutes over a medium heat until all the liquid is absorbed. Stir in the raisins and cashew nuts to finish and serve in little bowls for big impact.